Talking to presspersons later, Mr. Ranil Wickremasinghe said he would discuss with the government the question of providing provisions needed for one month to all victims and thereafter the assistance in regard to the rehabilitation of them. Arrival of foreign troops would not undermine the sovereignty of the country or the ceasefire agreement currently in force, Mr.Ranil Wickremasinghe said in reply to a question at the press briefing. 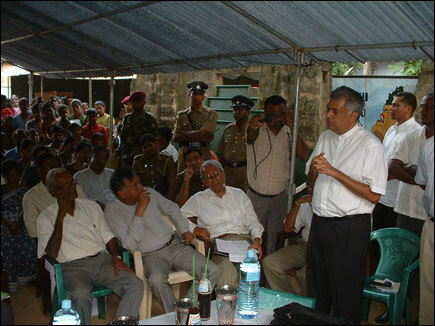 Mr.Ranil Wickremasinghe accompanied by UNP parliamentarian Dr.Jayalath Jayawardene arrived in Palaly Wednesday and toured the coastal areas affected by Tsunami escorted by army officials, sources said.